CATBALOGAN CITY – The officers and men of the 8th Infantry (Stormtrooper) Division recorded in its history the birth of the 87th Infantry (Hinirang) Battalion which was activated pursuant to Gen. Orders No. 145, dated April 9, 2010. The same Order subjected the 87th IB under the 8th ID for its administrative and operational control. The activation ceremony was held at 8:30 in the morning at the 8th ID grandstand on Tuesday, April 13, 2010. Meanwhile, LtCol. Leo Lorenzo Madroñal received his Appointment Order No. 241, as the first Acting Commanding Officer of the newly created 87thIB. Thereafter, the unit color was turned over to him by the 8thID Commanding Officer. On the other hand, MGen. Tabaquero congratulated LtC. Madroñal and the other officers and enlisted personnel who are currently assigned with this battalion for the distinction of being the pioneers of the 87th IB. However, they were warned of the price for being pioneers and that price is the likelihood that the success or failure of the unit will always be attributed to them. “…It is vision, not your resources that will make you successful. It is vision that will make you look beyond the obstacles and focus your sight on your goals and objectives. All your feelings of anxieties regarding limited funds, lack of personnel and others are part of the birth pains that the newly organized units must pass through” was Gen. Tabaquero’s motivation. The 8th ID leadership is hopeful that with the organization of the 87th Infantry (Hinirang) Battalion, their urgent mission to accomplish by June 2010 will be met. The final challenge to Madroñal’s leadership was simply said in two statements. “Leo, do good. Do not fail me!” says Gen. Tabaquero. The 87th IB will be stationed in Barangay Erenas, San Jorge, Samar the then location of the 34th IB which is now based in San Jose de Buan, Samar. TACLOBAN CITY – This year’s Earth Day celebration slated on April 22 calls to action individuals and groups to form a critical mass of champions for the environment through the 10 Million Movement (10 MM) in the region which seeks to gather 10 million individual commitments to do something for Mother Earth. This as it is environment department and other concerned environmental groups recognize that addressing climate change and protecting the environment require both individual and collective action. According to Dir. Letecia Maceda, regional director of the Environmental Management Bureau-8 here the Ten Million Movement is an advocacy campaign to get Filipinos who care for the environment to commit to take action instead of merely asking others to do something. The movement encourages individuals, groups, schools, offices, companies, government agencies and local government units to identify and commit to implement an environmental acts and to register this with the 10M Movement. “Everyone is also encouraged to share this information and inspire others to do the same so that we can create a significant number of supporters of the environment. Everyone has a role to play in the face of the changing climate,” Dir. Maceda said. Individuals who will affix their signatures in the sign-up sheet should commit to at least one of the following pro-environment activities: pollution/monitoring; clean-up and rehabilitation; greening; advocacy and other ways of caring for the Earth. The Ten Million Movement web site is accessible through www.10mm.ph. Meanwhile, the Department of Environment and Natural Resources Office in the region together with its line bureaus has lined up various activities such as advocacy, Climate Change and other Environmental Exhibit and Sayaw at Musikahan para sa Kalikasan to be staged at the Robinsons Place. On the other hand, EMB-8 will focus its Earth Day activities this year in Maasin City with several other advocacy and environmental programs slated to be conducted on April 22. Last year’s Earth Day program for the region was held in Catbalogan City. President Gloria Macapagal-Arroyo has declared April 22 as the "Philippine's Earth Day" through Presidential Proclamation Nos. 553 and 1276 making Earth Day a permanent environment holiday in the country. CATBALOGAN CITY – Some 5,603 job vacancies were available at the Jobs Fair and Seminar at the Samar State University (SSU) last April 13-14, 2010. The job fair is sponsored by the SSU Alumni Batch ’84 with the Department of Labor and Employment (DOLE) and the Philippine Overseas Employment Agency (POEA). Jobs available for abroad includes domestic helpers, factory workers, hotel staff and even dancers and singers. Recruitment agencies fully licensed like UniJobs International Manpower Services Corporation, New Era Placement Agency, Pacific Mediterranean, Mondial Overseas Corporation, Ascend International Services Inc., Mothers’ Way Employment Agency and 10th Storey Placement Agency have sent their personnel to recruit Samarnons for the jobs. Local recruiters like APAC needs some call center agents while Taytay sa Kauswagan, a leading micro finance firm said it needed some 150 personnel. Rosielyn Cesista, a fresh graduate of education from Dolores, Eastern Samar and an alumnae of SSU queued for the job fair. She told PIA that since it is difficult to apply for a teaching job, she would try to get at least one of the 5 thousand jobs offered. Peter Elias Dabuet from Paranas knows hydraulic operation and he found at least two companies needing the skill. MAKATI CITY – With less than a month to go before the May 10 elections, a governor and 11 mayors from Luzon and the Visayas have joined a growing list of local chief executives affiliated with different political parties who have pledged their full support to United Opposition (UNO) vice presidential bet Jejomar C. Binay. Among the local officials who most recently signed the manifesto were Gov. Rogelio “Roger” Espina of Biliran province, Mayor Edgardo Calingasan of Tuy, Batangas, and ten mayors of various localities in Leyte province, namely, Mayor Alfredo “Bejo” Romualdez, Tacloban City; Mayor Coefredo Uy, Catbalogan City; Mayor Proto Brazil, San Miguel; Mayor Teodoro Sevilla, Palo; Mayor Valente Adolfo, Mayorga; Mayor Alden Aveztruz, Barugo; Mayor Loreto Yu, Alangalang; Mayor Jul Co, La Paz; Mayor Manuel Sia Que, Dulag; and Mayor Irvin Dy, Julita. For his part, Binay thanked his fellow local executives for their support. “I am deeply moved and inspired by the full and unwavering support being vowed by my fellow local executives from around the country, regardless of their respective political party affiliations, for my candidacy as vice president of the Philippines,” Binay said. Binay also expressed confidence that such pledges from around 150 local leaders to date, including governors, mayors and councillors, will inevitably translate into actual votes for him in their respective localities on May 10. “I have great faith in their ability to deliver the votes because I know they themselves enjoy the trust and respect of their constituents,” Binay said. Binay has been the biggest gainer in recent surveys for vice president. He is now statistically tied with Sen. Loren Legarda in the vice presidential race as he advanced another four percentage points, based on the latest Pulse Asia survey. The results of a recent Social Weather Stations (SWS) survey conducted March 19-22 also showed Binay jumping from 17 percent in February to 21 percent. In his meetings with local leaders, Binay has repeatedly stated what he termed as the “closer to the people” principle, which he said underpins his belief that, being closer and more familiar with their respective areas of responsibility, they are in the best position to decide on what programs and services would best meet the needs of their constituents, and to act or respond promptly especially in times of disasters when lives are endangered. “The challenge to the next administration, and a test of commitment to public service for potential national leaders, will be their willingness to surrender control over local governments,” Binay said. “I sincerely believe that progressive barangays will mean progressive towns and cities, which in turn will beget progressive provinces and regions, and ultimately, a progressive Philippines,” Binay said. TACLOBAN CITY – The 7th Tanauan National Skim Open held in Tanauan, Leyte was a big success, Mayor Roque Tiu stated during the awarding ceremony at the Tanauan Shorelines in the evening of April 13. 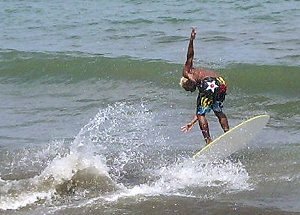 Mayor Tiu disclosed that the competition which was participated by about 100 skimboarders, was once again dominated by the local skimboarders who won the nod of the judges from the Philippine Skimboarding Federation, with their expertise and agility in playing with their skimboards along the Tanauan shorelines. The overall champion for the 7th National Skim Open is Brando Espada of Tanauan, Leyte, who is now richer by the P100,000 prize. Also, as part of his price, he will travel to Perth, Australia to represent the country in a skimboarding competition there. Arjun Jimenez of Cebu won the second place and the cash prize of P50,000. The third prize of P25,000 was awarded to Leo Espada of Tanauan while the fourth prize of P10,000 was bagged by Obet Yanuario of Tanauan, Leyte. For the Wahine Division, the champion is a 12-year old fresh elementary graduate from Tanauan, Leyte, Jona Ebañez who received a cash prize of P10,000. Sheryl Pajelleno of Tanauan; Jamaica Salceda of Tolosa and Arlene Nonato of Makati won the second, third and fourth prizes with cash reward of P7,500; P5,000, and P2,000, respectively. For the Groumet Division, Karl Gabas of Tanauan received the first prize of P10,000; Leander Apita of Borongan, Eastern Samar won the 2nd prize of P7,500; Hendrick Vargas of Tanauan won the 3rd prize of P5,000 and Niño Mercado of Tanauan won the fourth prize amounting to P2,000. Mayor Roque Tiu and An Waray Executive Director Jude Acidre also presented the prizes for the winners of the various side events in this year’s Skimboarding competition. For the Rumba Bugsay which is a paddle boat race, the winners were Ronnel Legaspi and Borjie Pardenas while the second place was bagged by Roy Lanza and Taruc Modeloso. Crispin Villegas and Rolando Legaspi won the third place. The Flat Track Race Beginner championship was bagged by Lorrie Faron while Joel Caidic and Raffy Virtudes, won the second and third places. The three winners are all from Tanauan. The Flat Track Race Open’s first, second and third places, was won by Beboy Layoza of Dagami; Raffy Virtudes of Tanauan and Aries Movio of Dulag, respectively. Meanwhile, the Wall Climbing Open Competition championship was won by Alezander Makus while Glindy Alvero and Dominic Aguilos won the second and third prizes. The Wall Climbing Women Catergory was won by Kenneth Alminar while the second and third places went to Faye Culas and Pedrosa Ivy Sanijon. For the Wall Climbing Novice category, the winners are Kim, Kevin and Tristan Cusi. The winners for the Bikini Open were Niña Sherra Tagalog of Palo; Jenelyn Yatar of Burauen and Vitchie May Perez of Palo. For the HipHop Dance Craze the first place went to Zero Gravity and the second place went to the Innocence dance group. The 7th National Skim Open was made possible with the support of An Waray thru Congressman Bembem Noel; the Provincial Government of Leyte thru Governor Carlos Jericho Petilla; the Municipal Government of Tanauan and the various sponsors. TACLOBAN CITY – Media practitioners and foreign observers who wish to cover and observe the conduct of the May 10, 2010 elections must apply for accreditation with the Commission on Elections, on or before the deadline on April 15. The reminder is pursuant to COMELEC Resolution 8764 which outlines the guidelines covering mass media accreditation. “It is expected that the 2010 Automated National and Local Elections will generate great media attention, both foreign and domestic,” states COMELEC Resolution 8764 which outlines the guidelines covering mass media accreditation. All parties requesting for media accreditation, the COMELEC said, shall be required to submit a duly accomplished Accreditation Application form; two recent 2’x2’ colored photos; and an endorsement from the media agency employing the applicant. Members of the foreign media will be required to submit photocopies of their International Press Center Card (IPC) for the year 2010. All applications for accreditation must be personally filed from February 1, 2010 to April 15, 2010 before the COMELEC Education and Information Department (COMELEC-EID), in the case of national and foreign media. In the case of local media, applications for accreditation must be submitted at the Office of the Provincial Election Supervisor (OPES). Foreigners or groups of foreigners who wish to observe the May 10 elections may apply for accreditation with the COMELEC through the Director IV of the COMELEC-EID. The period for filing applications for foreign observer accreditation will run from February 1, 2010 until April 15, 2010. Applications must be filed personally before the COMELEC-EID, supported by the following documents: A) Duly accomplished information sheet, B) Two recent 2’x2’ colored photos and C) Endorsement by the Ambassador or Consul of the home country of the applicants. MANILA – Nacionalista-Makabayan senatorial candidate Liza Maza demanded that the Commission on Elections conduct an immediate investigation on the vilification campaign conducted by the 69th Infantry Battalion of the Philippine Army against progressive party-lists Gabriela, Bayan Muna, Anakpawis and Kabataan on April 6 at the Philippine College of Technology (PCT) in Bajada, Davao. "This is a clear violation of the Omnibus Election Code which prohibits the military from participating in partisan politics. The COMELEC should immediately look into this and sanction the officers and members of the 69th IB who participated in this," Maza said. Likewise, Article IX-B, Section 2(4) of the 1987 Constitution and Section 55 of the Administrative Code of 1987, also state, respectively, that “No officer or employee in the civil service shall engage, directly or indirectly, in any electioneering or partisan political campaign” and “No officer or employee in the Civil Service including members of the Armed Forces, shall engage, directly or indirectly, in any partisan political activity or take part in any election except to vote nor shall he use his official authority or influence to coerce the political activity of any other person or body”. According to witnesses, the military urged the students of PCT not to join or support the above-mentioned groups which are New Peoples Army fronts and use their respective “pork barrel” from Congress to support the armed wing of the Communist Party of the Philippines. “The malicious linking of progressive party-lists to the CPP-NPA is an old issue that has yet to be proven by those who seek to destroy the credibility of individuals and groups that seek to genuinely serve the Filipinos,” Maza said. Maza pointed out that Gabriela, Bayan Muna, and Anakpawis have not been receiving their respective Priority Development Assistance Fund – more commonly known as the “pork barrel” – since 2004 due to them being the main critics of the Arroyo administration. She also stressed that said party-lists are pro-abolition of the “pork barrel”. TACLOBAN CITY – The Philippine Insurance Health Insurance Corporation is set to introduce its Remittance-by-Air on April 16, from 6:00 o’clock to 7:00 o’clock in the evening, at Robinson’s Place Tacloban. Mr. Walter Bacareza, Regional Vice President of PhilHealth informed that the launching activity will include live entertainment featuring local artists, funfare and promos. PhilHealth will also set up a Service Desk within the mall from 10:00 o’clock in the morning to 5:00 o’clock in the afternoon to provide on-site registration and information to members and non-members alike. The Remittance-by-Air provides a convenient way for individually-paying members to pay their premium through Smart and Talk n' Text prepaid mobile phones. This way, Philhealth's individually paying members may now pay their premiums without sweat, through texting. The members are able to save time and money because they are no longer required to go to the bank or visit a Philhealth office to pay their premium. Members must type PHICPhilhealth identification number (PIN) [Ex. PHIC 120123456789] and send it to 7442. The system will send back the PIN with the corresponding name of the member for confirmation. If the name is correct, the member will be required to reply PHICYES to 7442. Upon completion of the transaction, the amount of P115 will be deducted from the member's phone load. P100 of the total amount will cover the premium for one month, while the remaining P15 will pay for transaction fee. The member will then receive a thank you note and the reference number as proof of payment. CAMP APOLINARIO, Panacan, Davao City – A mayoralty candidate together with a former Village official were abducted by New People’s Army (NPA) terrorists in the village of Marayag in Lupon town in Davao Oriental 3:00 PM Sunday. Former Lupon town mayor Arfran Quinones who is running as Independent was with eight of his supporters in a campaign sortie when about 30 armed NPAs clad in military uniforms led by a certain Benjie of Sentro de Gravidad, Local Terrrorist Front-18 held them at gunpoint. Terrorists freed seven of the victims three hours later while Quinones together with a former Barangay Kagawad of Marayag identified as Ronisito Pedro are still being held against their will. Reports reaching authorities indicate the possibility of the failure of Quinones to pay extortion money disguised as “Permit to Campaign Fee” as the motive. The freed victims also said their vehicles were searched for guns as the terrorists were planning to confiscate them but no firearms were found. Governor Arturo Uy of adjacent Compostela Valley (ComVal) province is reportedly negotiating for the release of the victims from the hands of the terrorists. The brazen act of the NPA in Lupon is one of the strings of election related incidents perpetrated by the Communist in the past weeks. In March, two followers of a local candidate in Davao City were abducted and later freed while their vehicle was car-napped and later left on the roadside after the candidate reportedly refused to give-in to the NPA terrorists’ extortion demand. Armed NPAs were also noted to campaign for some candidates and partylist groups. Early morning of Sunday, soldiers clashed with NPA who were reported to be planning to meddle in the coming elections in Paquibato District in Davao City. 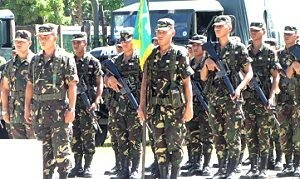 Authorities said consistent reports coming from residents on the presence of armed men directly campaigning for some candidates and partylist groups being indorsed by the Communist Party of the Philippines prompted troops of the army’s 69th Infantry Battalion to respond which resulted to the gunbattle. Last week, a local paper in Davao City reported the case in Mati City in Davao Oriental regarding NPAs posting campaign materials of two senatorial bets linked to the left together with a presidential candidate to the dismay of local residents while in Mawab town in ComVal province, troops from the 3rd Special Forces Battalion clashed with NPAs after residents informed government troops on the presence of armed individuals openly campaigning house to house favoring some partylist groups. Last March, soldiers of the 67th Infantry Battalion in Baganga town in Davao Oriental also clashed with NPAs after residents reported armed men campaigning for particular partylists. CATBALOGAN, Samar – Hon. 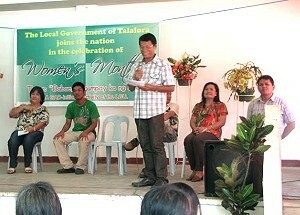 Cornelio M. Bersales, Municipal Mayor, pampers Talalora women by holding LGU-GAD initiated activities annually since 2007. Once again, last March 25, more or less 100 women participants, representing the academe, plain housewives, barangay officials and health workers of twelve (12) barangays, attended the Women’s Summit at the St. James Multi-Purpose Center, this town. Talalora mayor Cornelio Bersales delivering his message to the Summit participants. The Women’s Summit is an LGU-GAD initiated activity in coordination with the St. James Parish and the Social Action Center of the Diocese of Calbayog. Likewise, the whole-day summit is in line with the Women’s Month celebration held every March. This year’s theme is “Babae, Tagumpay ka ng Bayan”. According to Ms. Zanaida C. Dilao, GAD focal person of Talalora, the Municipality consistently allocates 5% from the total local Income for GAD activities. “Last year, we participated in the 16th National Congress of Women in Nation Building (WIN) held last Sept. 23-30, 2009 at the Heritage Hotel, Pasay City. We were acknowledged for initiating activities for a Gender-sensitive LGU.” adds Ms. Dilao. Mayor Bersales mentioned about their year-round services that include free pap smears, dental care, supplemental feedings and skills training as empowerment tools for women, in particular. For this year’s celebration, the role and rights of women were given special focus. Ms. Lourdes D. Duenas, a Social Worker, discussed women protection laws. A more elaborated discussion of RA 9262 or Violence against Women and Children (VAWC) increased the participants’ awareness in addressing physical, emotional/psychological and economic abuses on women within the family structure. In the same venue, the right of women to suffrage was stressed with COMELEC Officer, Mr. Julian Uy, as resource speaker. The issues regarding the conduct of automated elections were clarified during an open forum. Rev. Fr. Cesar D. Aculan, Social Action Director of the Calbayog Diocese, shared his views on Responsible Voting and Solid Waste Management. The importance of Public Health Care for Women was lengthily tackled in a power point presentation made by Dr. Joselito C. Cablao, Municipal Health Officer of San Sebastian. All participants agreed that the day ended fruitfully. “Damo gud amon nahibaruan nga magtututdo ha amon han amon kada adlaw nga mga desisyon. Deri kami nagbabasol han amon pagkanhi,” a participant commented. Finally, Mayor Cornelio Bersales expressed his heartfelt thanks to everyone for making the activity a successful one. TACLOBAN CITY – There will be no extension of the deadline for the filing of income tax returns on April 15, the Bureau of Internal Revenue (BIR) said as it called on the taxpayers to file their taxes early in order to avoid the last minute rush. BIR Commissioner Jose L. Tan-Torres said BIR is strongly urging the taxpayers to file their tax returns as early as possible as the agency is rendering all efforts to make tax compliance easier through accessible information through all their district revenue offices and via the internet or contact center at 981-8888. A BIR report stated that BIR is encouraging those who are qualified to comply via the electronic filing system can also easily do so through the internet. The taxpayers are also reminded to use the current tax returns and to accomplish all information in the tax returns to avoid penalties, as the agency has put in place several measures including the accomplishment only of three sets of the income tax returns and attachments, the submission of the statement of management responsibility and the need for tax agents or practitioners to indicate the accreditation number in the tax forms and documents. The BIR Commissioner further said that BIR's computer system with its extensive information warehouse is now able to check if taxpayers have properly reported their earnings. Moreover, BIR has also been vigorously pursuing their Taxpayer Lifestyle Check and the Re-invigorated Run After Tax Evaders Program against taxpayers who continue to evade their tax obligations. The BIR chief added that with the tax treaty network, the tax offices of foreign countries are now furnishing BIR information on investments and income earnings of Filipinos abroad which should also be reported in the income tax returns. The BIR has also set some tasks after the tax deadline, which include a focus on their audits of those taxpayers who have met the benchmarks of increased tax payments and honest compliance.